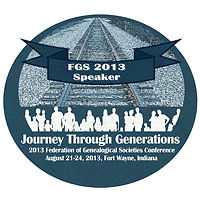 So… all ready for the Federation of Genealogicial Societies conference in Fort Wayne, Indiana, next week? Allen County Public Library research to-do list? So what else do you need for an excellent learning experience at the FGS conference? Well, um, er, uh… how ’bout a personal invitation to come join The Legal Genealogist for any one (or more!) of three presentations? Our ancestors’ marriages lasted so much longer than our own. One reason: it was so hard to get a divorce. But it still happened, and the records created in the process tell us much about our ancestors, their lives and the laws they lived by. This was supposed to be the Age of the Information Superhighway. Physical access to courthouses and archives, coupled with massive digitization projects and easy availability of Internet access, should have made this a genealogist’s dream: a time when everybody had access to just about any kind of information residing anywhere. It hasn’t worked out quite that way. Even as so many records are becoming so much more accessible as they come online, doors are being slammed shut on so many more — often records that aren’t and won’t be online, now and perhaps ever. Every time we speak or write about or publish our genealogies, as individuals or societies with journals and books, we want to stay out of copyright trouble and protect our own copyright in our work. To do that, we have to understand what’s copyrighted and what isn’t, when and how copyrighted materials can be used, and how to handle copyright issues with our own work products. Looking forward to it–although completely unsure which sessions I’ll end up at!